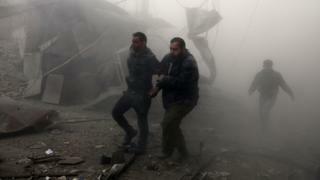 Four days of intense Syrian government strikes on a besieged rebel-held area outside Damascus are reported to have killed more than 200 civilians. A monitoring group and opposition activists said at least 54 people, including 15 children, died in attacks across the Eastern Ghouta on Thursday. The enclave has been under siege since 2013, but the government stepped up its campaign to retake it on Monday. The UN and US have called for an immediate cessation of hostilities. But the Syrian government's main ally Russia said that was "not realistic". An estimated 400,000 people are trapped in the Eastern Ghouta and face severe shortages of food, fuel and medical supplies. Some 700 critically ill and wounded patients need to be evacuated for treatment, but the government has not given the UN access for this since late November. Rescue workers and medics have been overwhelmed since the battle for control of the last major rebel stronghold near the capital escalated. The Syrian Observatory for Human Rights, a UK-based monitoring group, said at least 201 civilians had been killed and hundreds more injured by government air and artillery strikes since Monday. The Local Co-ordination Committees, an opposition activist network, put the death toll at 220. 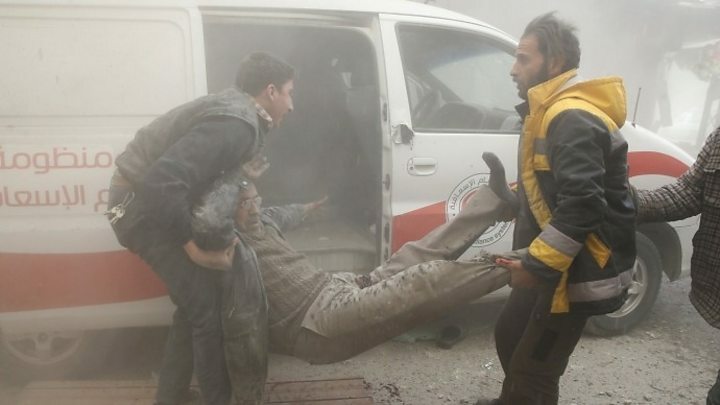 In Thursday's deadliest incident, nine children and 12 adults were killed when a market in the town of Arbin was bombed, according to the Syrian Observatory. "These are the worst four days that Eastern Ghouta has ever gone through," said Hamza, a doctor at a clinic in Arbin, told AFP news agency. "As a doctor, the hardest thing you can do is to treat your loved ones, your colleagues, your neighbours, your relatives," he added, breaking down. The Syria Civil Defence, whose first responders are widely known as the White Helmets, posted videos online showing the reaction of one its volunteers to discovering the body of his mother in the rubble of a collapsed building. Shells fired by rebels based in the Eastern Ghouta meanwhile reportedly killed two civilians and damaged houses in the government-controlled Old City of Damascus. On Tuesday, UN officials appealed for an immediate cessation of hostilities, lasting for at least one month throughout Syria, to enable the delivery of humanitarian aid and services to besieged areas, and the evacuation of the critically ill. The US, which backs the Syrian opposition, backed the call on Thursday, saying it was "appalled" by the escalating violence and multiple reports of Syrian government forces dropping bombs filled with chlorine on rebel-held areas. "These attacks must end now," state department spokeswoman Heather Nauert said. "Russia must use its influence with Damascus to ensure the Syrian regime immediately allows the UN to provide vital assistance to this extremely vulnerable population," she added. The Russian permanent representative to the UN dismissed the proposal. "We would like to see a ceasefire, the end of the war, but the terrorists, I am not sure, are in agreement," Vassily Nebenzia told reporters in New York.